Dee Dixon beat out the throw to first in this July 1987 game for AA Shreveport and he did it in a critical spot - with the score tied in the ninth, according to The Shreveport Times. He did so by hitting the ball to short. He soon scored the winning run, The Times wrote. "I'm working on a new thing," Dixon told The Times of the hit. "I'm trying to smack it at the shortstop when he's playing real deep. Anything in the gap (between short and third base) is a base hit." Dixon legged out that hit in his second season as a pro. He went on to play in three more. He never made AAA. Dixon's career began in 1986, taken by the Giants as their 17th pick in the draft out of his native Poughkeepsie, NY. Dixon was also credited by his given name, Andrew Dixon. Dixon started with the Giants at short-season Everett. He got into 56 games and hit .220. He stole 37 bases. He split 1987 between Shreveport and single-A Clinton. He stole 71 bases that year and hit .300. 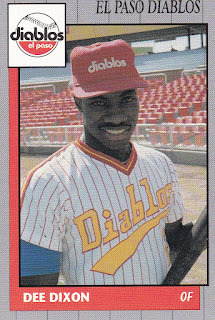 Dixon then played 1988 completely at Shreveport and he remained in AA through the end of his career. He hit .290 and stole 72 bases in 1988, then hit .282 and stole 42 bases at Shreveport in 1989. He moved to the Brewers system in 1990 and played at AA El Paso. He knocked in two runs on a single in a May game. He then tied a June game on a single. He hit .286 over 127 games and stole 53 bases to end his career.